There’s a fundamental corniness to Designated Survivor that I find fascinating. It’s not really a good thing; at its worst, the show feels like a script someone wrote in 1992 that’s been dusted off and filmed with only the slightest cosmetic changes. (“And in this scene, the president has a cell phone.” “Oooooo.”) The result is something that’s just a little too hokey to take seriously, that dabbles in conspiracy and malice without ever really getting its hands dirty. But that can be reassuring as well. I’m not sure I ever lose myself in this show, but I do appreciate seeing its plots unfold with stolid competency. Also, I like the way it treats basic elements of our government like the mythology of some labyrinthian fantasy world. 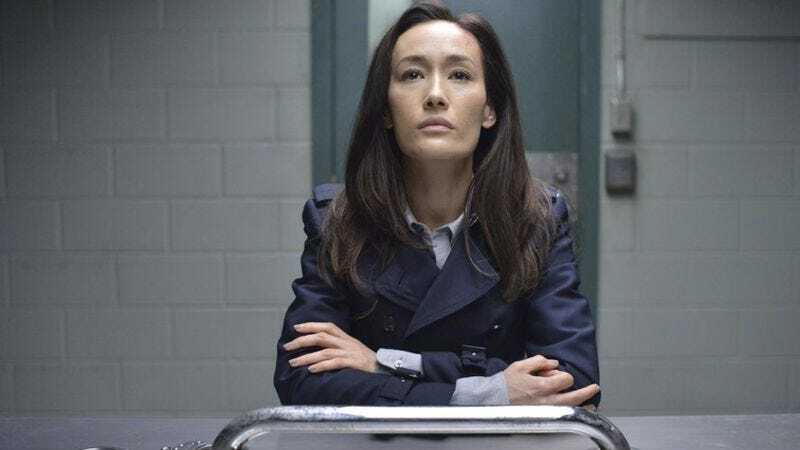 The whole premise rests on a semi-obscure piece of line of succession protocol, and each new episode seems to introduce a plot point that offers the characters a chance to throw out a new lesson in basic civics. Tonight, it’s the 25th Amendment, the one that deals with what happens when the President is rendered dead or otherwise incapacitated. That’s not exactly obscure, but it’s brought up multiple times, because part of the appeal of the show is the reassurance of seeing America’s government threatened but never beaten; in watching a world where the systems we have spent centuries trusting are still capable of withstanding any threat, no matter how grotesque. “Warriors” picks up more or less where “The Oath” left off. The sniper fires, distracted at the last second by a shot from Hannah down below; but we quickly learn that, distracted or not, the bad guy still hit his target, with Kirkman going down with a bullet wound through the chest. Given the echoes of The West Wing, I had expected someone else might have been wounded, or even killed, and it’s both unexpected and mildly disappointing to see the President taking the fall. The disappointment comes from me forgetting how this show works, really. It’s much better at simulating story risks than it is at actually taking them, which is why we get the thrill of seeing Kirkman shot, but then the almost immediate reassurance that the bullet passed right through him hitting no major organs. That’s too easy, though, so it turns out there are fragments that need to be removed, putting Kirkman under the knife. The surgery goes well, except for a few seconds when things get tense—but it’s such a calculated, sterile sort of tension that it’s impossible to take seriously. Kirkman is the title character and the show’s biggest star. He’s not going to die midway through season one, and pretending that he might is just foolishness. No, the real value of putting Kirkman in the hospital is that it means MacLeish gets to take power, if only for a few hours. It’s another turn that’s more exciting in the set-up than it is in its resolution. His two major decisions are to leave the stock markets open while Kirkman is under the knife, and to make sure that the assassin who nearly killed the President gets killed himself when the government tracks him down. Neither of these are particularly clever moves for MacLeish’s long term viability as VP. The former makes him look, at best, idiotic, while the latter is the sort of desperate loose-end tying that always gets people caught in Columbo episodes. While there’s a certain crude logic in making sure the assassin never gets to tell his story, there’s no subtlety to MacLeish’s play, and given that Hookstraten is having doubts, all he’s really doing is giving more people a trail to follow. Given the doubts he keeps expressing to his wife, maybe that’s supposed to be intentional; maybe it’s a subtle way of suggesting he wants to get caught. Or maybe he’s just not very good at being a bad guy. Whatever the reason, the fact that he’s in charge just long enough to get rid of the most immediately dangerous piece of evidence tying him to the assassination attempt is both a bit much, and entirely in keeping with the show’s plotting up until now. It’s not particularly elegant, but at times seeing the strings can have its own curious charm, especially when the actors remain committed to their work no matter how shallow it becomes. Sutherland is particularly good at this, giving Kirkman a base level of intensity even at his most decency that makes it almost possible to believe all this goofiness actually matters. The biggest downside to the surgery was that it kept him out of play for so much of the hour. Hannah’s solution for getting info to Mike is to tackle him and whisper in his ear. She’s a problem-solver, that one. Hey, nerdy tech guy is back! I forgot how much I liked him. Mrs. MacLeish talked a bit about blood tonight, in case anyone was missing the Lady MacBeth parallels. “Are you threatening me?” “Absolutely.” MacLeish is not long for this world, I think. The episode’s title comes from a flashback: Alex, waiting for Tom to come out of surgery, remembers the day he told her he’d been offered the HUD Secretary job. It’s a sweet moment that tells us nothing new about either character. The Kirkmans definitely have kids, and those kids are nowhere to be seen until the very end of the hour. Which I guess is plausible; Tom had to go into surgery quickly, and the hospital probably wasn’t a great place for children. But after spending so much time trying to make us care about the paternity of the President’s teenage son, it certainly feels like they’re being pushed aside. Which leaves poor Alex with even less to do, unfortunately.